There are alternatives to putting busways underground and to building flyovers as a means of providing public transport. Rail was investigated in the 1990s and was ‘found’ to be too expensive and not supportable by population density and therefore demand in the eastern suburbs. But no one can produce a detailed analysis, so is this just a fob off by Translink?During a public consultation session at the Stones Corner library in July 2006, Translink representatives refused to talk about a rail alternative saying that their brief was to produce a busway. Translink do not want to talk to anyone who is canvassing options that they have already rejected or not considered fully. In early 2006 there was a CATCH (local community group looking at public transport alternatives) meeting when a rail enthusiast got up and talked about the old Belmont Rail that came off the railway line just past Norman Park Station and went along the cutting on Oateson-Skyline Drive? He mentioned that the cutting had already been built for rail in the 1920s. With one flyover across Bennetts Road, a couple of tunnels and the use of light rail along the old Carina Tramway, a rail connection would be able to miss all the residents houses and provide a direct rail link along the old tramway at Carina to Carindale and Capalaba. I have marked the route on the map. The rail enthusiast also talked about rail/bus hybrids. He should be consulted to find any further proposals he may have. If The Qld government improves the rail infrastructure (perhaps even adding another rail line) to Norman Park Station and then choose the route to Capalaba that I have shown on the map then you have the Translink problem of getting people to the CBD quicker without interfering with residents or building huge bus and road infrastructure. In my plan buses would be used locally to enable residents of the inner suburbs to get to the train quickly and easily. Why not at least consider these suggestions? Because Translink has an agenda that opposed rail from the outset. By the way, I think that the data I collected and analysed in the attached spreadsheet indicates that traffic congestion at Camp Hill is not the problem claimed by Translink in the discussion I had with them at the Stones Corner Library. 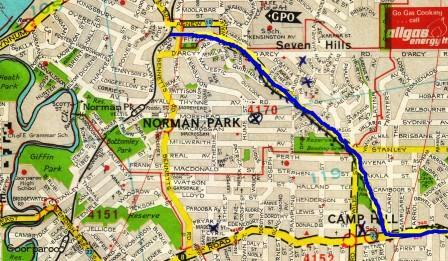 With a few exceptions, the worst traffic congestion occurs closer to the CBD than Camp Hill. This is degrading quality of life of the inner suburbs. Translink have ignored the social cost of the infrastructure they are building. The increased bus pollution near schools and shopping centres is one example of that social cost. That is why a clean, high volume, electric rail system is necessary in the eastern suburbs, to relieve the traffic congestion within 8 kms of the CBD. Has Translink ever done a proper detailed study of demand for rail in the inner city? My railway station, Cooparoo, is a very busy station and this is true of all the stations closer to CBD. Yet Cooparoo station has had minimal improvement in the past ten years. The parking is inadequate, the crossing at Cavendish Road is third world, and there are not enough pedestrian footways, buses or bikeways servicing this station. This entry was posted in Categories, community, Environment. Bookmark the permalink. I follow your posts for a long time and should tell you that your articles are always valuable to readers. (Editor’s Note: There was an advertisement attached to this post in the URl section. 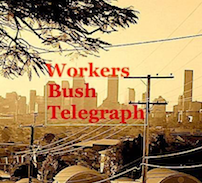 I have deleted it because advertising for profit (commercial or business) is not permitted on Workers BushTelegraph. Of course union or community notices are regularly posted on WBT. 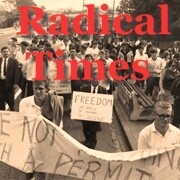 We are a not-for-profit publication).